You may have heard through the grapevine that Mark Cuban is an aggressive investor in early stage startups. Take the Shark Tank out of the equation and Cuban is still eager to invest in good technology. 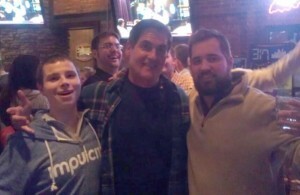 Many people also know that Mark Cuban is one of the nicest and most approachable billionaires in the world. You can pretty easily find his email address online and if you’ve got a good question or a good pitch he’ll actually respond to you. Heck he’ll even let you talk smack about basketball. But earlier today one startup founder took the absolute wrong approach to win over Cuban’s ears and investment. It seems that this founder is in the process of closing a round. He apparently has a commitment from Peter Thiel and wanted Cuban to get in as well. So what does he do? He emails Mark Cuban with the subject line: “Peter Thiel invested so you’re lucky I’m emailing you”.